all about bintoy! : How E-bomb Works..
An e-bomb would destroy most electrical machines in its path. An electromagnetic bomb, or e-bomb, is a weapon designed to take advantage of this dependency. 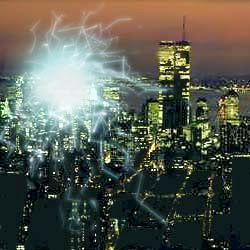 But instead of simply cutting off power in an area, an e-bomb would actually destroy most machines that use electricity. Generators would be useless, cars wouldn't run, and there would be no chance of making a phone call. In a matter of seconds, a big enough e-bomb could thrust an entire city back 200 years or cripple a military unit. The U.S. military has been pursuing the idea of an e-bomb for decades, and many believe it now has such a weapon in its arsenal. On the other end of the scale, terrorist groups could be building low-tech e-bombs to inflict massive damage on the United States.